Traditional portfolio management is based on the premise that you allocate to stocks for growth and bonds for stability. Bonds earn their place in a portfolio by providing valuable diversification benefits as they typically counteract stock market losses during bear markets. Bonds can act as both a source of dry powder when stocks are falling and as an emotional hedge for those investors who either aren’t willing or don’t need to take a large amount of equity risk. At current interest rate levels many investors are beginning to question this dynamic. The new question then becomes: what happens to stocks when bonds lose money for investors? Investors don’t usually think about the relationship this way, but it can also makes sense to understand if stocks diversify bonds when things go wrong in fixed income land. Over 88 years there were 16 annual losses in bonds. In just 3 of those years stocks were also down. So more than 80% of the time when bonds have shown a loss stocks have been up. And on average stocks have provided a nice spread over bonds when they have fallen. You can also see that the average annual loss from bonds has been relatively tiny. A bad year in bonds can be a bad day or week in stocks. What this tells us is that interest rate risk has not been the biggest risk to owning bonds in the past. The biggest risk has been inflation eroding your purchasing power. After inflation bonds have actually lost money 37 out of 88 years or roughly 40% of the time. In those 37 years stocks were down 12 times. 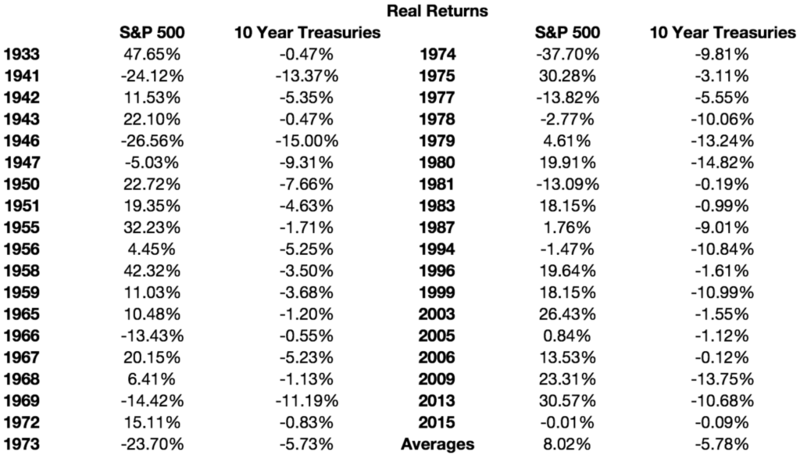 That means real stock returns were positive almost 70% of the time when real bond returns were negative. These are just annual returns so I think it can also make sense to see what happens over an entire bond bear market cycle. However, the sample size for this is quite small considering bonds have basically been in an unrelenting bond bull market since the early 1980s. But from 1950-1981 bonds did in fact experience a brutal bear market. Again, this was because of inflation and not just rising rates. Nominally 10 Year Treasuries were up almost 3% per year, but real returns were down almost 1% per year, a loss in purchasing power of more than 40% in total. In that same period stocks were up over 500% after accounting for inflation. 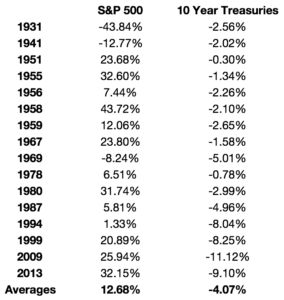 Based on these numbers it does appear that stocks have diversified bond risk in the past. Many investors are concerned that stocks and bonds in the U.S. are both priced too high at the moment and that each could experience difficult times ahead. For that to happen over an extended period of time my guess is that we would need to see higher than expected inflation kick in. The Blueprint for a Bond Bear Market?